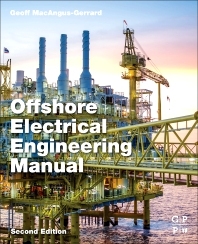 Offshore Electrical Engineering Manual, Second Edition, is for electrical engineers working on offshore projects who require detailed knowledge of an array of equipment and power distribution systems. The book begins with coverage of different types of insulation, hot-spot temperatures, temperature rise, ambient air temperatures, basis of machine ratings, method of measurement of temperature rise by resistance, measurement of ambient air temperature. This is followed by coverage of AC generators, automatic voltage regulators, AC switchgear transformers, and programmable electronic systems. The emphasis throughout is on practical, ready-to-apply techniques that yield immediate and cost-effective benefits. The majority of the systems covered in the book operate at a nominal voltage of 24 y dc and, although it is not necessary for each of the systems to have separate battery and battery charger systems, the grouping criteria require more detailed discussion. The book also provides information on equipment such as dual chargers and batteries for certain vital systems, switchgear tripping/closing, and engine start batteries which are dedicated to the equipment they supply. In the case of engines which drive fire pumps, duplicate charges and batteries are also required. Geoff MacAngus-Gerrard is currently on the Supply Lecturer Register for the University of the Highlands and Islands (UHI), Scotland. He was a chartered electrical engineer who is particularly experienced in conceptual design of electrical power systems and the solving of problems associated with reliability and safety related to the security and survivability of power systems on offshore and petrochemical installations. He has worked primarily on offshore-related projects for the last 24 years, at a marine consultancy for 3 years and in various petrochemical projects for 5 years.